Every two weeks through the summer Jerry and I lead a guided tour around Skokholm Island, and occasionally things don't go to plan. We set off this morning with a boat load of visitors eager to get onto Skokholm to see the wonderful wildlife, but as we reached the island on the experienced Dale Princess we had a rather unfortunate experience. The swell of the sea drove the Princess away from the landing point, much to the disappointment of the visitors. 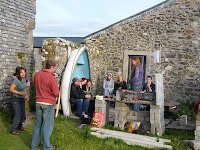 Many of the guests have been coming over to Skokholm for 50 years!!! But, much to their delight, they were offered the alternative visit to Skomer Island! 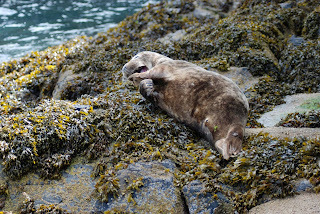 The wildlife of both the islands are similar, although the numbers of each species differs on both Skomer and Skokholm. The main things to see on Skokholm is the old cottage, which was inhabited by Ronald Lockley on his naturalist adventures, also the rare Blue Pimpernel which is seen on the island. Along with these the vast birdlife draws visitors to visit Skokholm, some main species to see is the breeding choughs, Peregrine, Guillemots, Razorbills, Puffins and many more!Many of these birds can be seen on Skomer, and the visitors enjoyed the sights and sounds of Skomer. They enjoyed watching hunting Short Eared Owls, Choughs at the wick, and Buzzard Pairs at Bull Hole and at the Garland Stone. 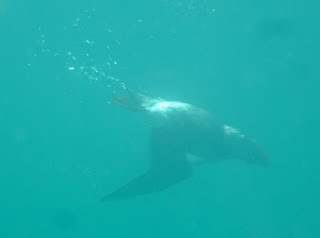 Along with this, they were able to see surfacing porpoise, and seals hauled out on Skomer's many beaches. 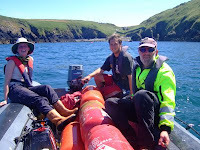 All in all, everyone enjoyed their day out here on Skomer, and soon forgot about the morning fiasco. If you would like more info on visiting either Skomer or Skokholm please click on the link to the Wildlife Trusts' website. Apart from that, Tessa, Jo, Ben and Holly were interviewed for Countryfile. They will be appearing on Sunday on Channel BBC 1, make sure you keep your eyes open for that! It is Tessa's debut appearance on Television, and we are very proud! We are all excited to see the outcome on Sunday. Ben and Holly are pictured above with the presenter and a week old Shearwater chick, they were talking about the research they are carrying out on the island, so to learn more tune into the programme or keep up to date with this blog. Dave B is currently undertaking his second 24 hour puffin feeding watch, and he will complete it tomorrow at 1pm, after a long and strenuous watch. This feeding watch allows us to work out the feeding ratio of each puffin chick, and what type of food the parents are bringing in to feed the chicks. We will know tomorrow how well the Puffins are doing, and hopefully they will be doing as good as usual! I'm now off to enjoy Sam's wonderful Ginger Cake which was kindly made for me! We said goodbye to our friendly, hard-working group of volunteers and welcomed a new set who'll be with us for the next week. I went down to cover the morning at the Wick, which is something I very rarely get to do. It was really pleasant; not too many people about, not a massive number of puffins but those that were there were very relaxed about our presence as they loafed on the grass or ran across the path with beaks full of sand eels. The highlight of my day was getting in the sea with full dive kit, rather than just splashing around on the surface as I've been doing the previous days. I just swam out into North Haven with the intention of watching puffins underwater. And wow, did I succeed! They're equally, if not more, curious about people in the water as on land, with the added confidence that they're really in their natural habitat. If you drift or swim out slowly toward them they'll come fairly close to investigate. Drop a little underwater and they'll come to see what's up with all these bubbles, poking their heads under the surface to check beneath them. If this isn't enough the bravest ones will swim down and check you out. Underwater you can really appreciate why they're built like they are. They use their short wings and powerful, compact bodies to fly through the water like little penguins. They are as agile underwater, with all their quick, darting turns, as they are awkward in the air and clumsy-looking when they land. Swimming with them is definitely an experience I'd recommend to anyone. Though I'd also recommend wearing a thick wetsuit to do it, as I've spent the afternoon wearing a fleece and woolly hat to warm back up. Puffins weren't the only marine life about today, there's a few jellyfish; Moon (pictured), Lion's Mane (only small ones, not capable of a painful sting), Compass and the blue Cynea lamarkii. I love watching jellyfish moving around underwater, they're so different to almost any other wildlife. I think it's the closest I'll ever get to seeing aliens. 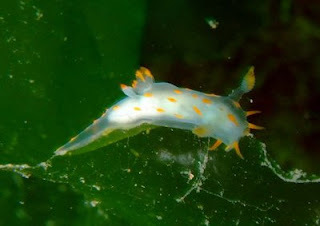 There were a few small nudibranchs feeding on the macro-life on the seaweed. 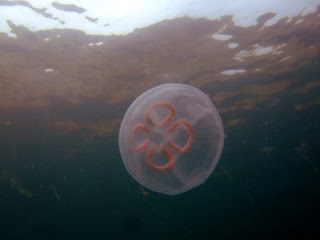 As with the jellyfish these are spectacular creatures, so unlike anything one normally sees. Polycera quadrilineata, I think, though would welcome corrections. Terrestrially it really feels like summer as today there's been Meadow Brown butterflies mating and an Emperor Dragonfly. Hope everyone else has been enjoying the sun as much as we have out here. 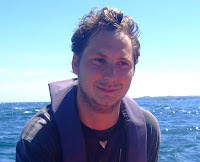 Skomer / Skokholm Assistant Warden. Yesterday evening was tremendously exciting as we got caught in the middle of a massive storm, with lightning striking to the north, east and south. Not just the usual big bolts but blinding flashes of sheet lightning and some forks traversing the underside of the clouds. Everyone was out either trying to get photographs or just enjoying the spectacle; there were more “oooohs” and “aaaaaaahs” than I’ve ever heard on Bonfire Night. Just prior to the first lightning, before it got dark, there was the equally spectacular sight of the majority of the puffins in North Haven getting spooked and wheeling round in the air, thousands of them. Today started off a bit foggy and wet. Still the first two boats were packed with early day trippers, though the weather put a few people off and it got quieter. A shame as the afternoon was really sunny and the sea was so flat. Two of the visitor boats going back got Common Dolphins accompanying them, which is a real treat. It was my day off today and it coincided with that of several others too, so we had a big expedition to Haverfordwest. We indulged in all the treats of the mainland; cake and milkshake in one café and hand-pulled pints and chips in a pub. In between we browsed the shops picking up a few essentials, in my case a pair of trainers that aren’t falling apart at the seams and insect-bite relief cream. In Tessa’s case a new dress and awesome hat. The latter required much consultation, in fact it was such a complex process we had to recuperate at another pub before we could attempt our big shop. Going around a massive supermarket is always a bit of a shock to the system after the spending so much time away from it all on Skomer. I find myself alternately wanting to leave as I can’t face the people and the bombardment of information, and wanting to buy the most impractical of products as I’ve not been able to have such a choice of food for so long. It’s nice to be back on Skomer, particularly on such a calm evening. Another full day; 250 visitors, 2 school groups and film crew from The One Show. Jo and Dave returned yesterday afternoon and had a very little time off before being thrust back into work. Dave's been off today to buy food for a group from Cardiff University who are here for a few days carrying out a variety of projects. It's an amazing effort catering for groups, I don't envy Pete doing the cooking or Dave the shopping. Today he picked up 34 loaves of bread (all there was in the supermarket), 14 leeks and 4 kilogrames of tomatoes, amongst a lot more. All this with just Haf's help, if you can call constant begging for sweets and cake help. The best thing about there being a catered course is that there's almost always leftovers; I'm going to finish this then eat a lovely looking slice of cheesecake. There was a particularly friendly seal around the jetty this afternoon, one of last years pups that hangs around there quite often. It's more than compensation for visitors who've just been told they can't fit a return boat and will have to wait another half hour, this curious young seal swimming along with it's head held high out the water, staring at them. Disappointingly it had got bored of people by the time the last boat left and I went for a swim. I've been in the last four days now and either the water's getting warmer or I'm getting immune to cold. Lots of butterflies about today. Painted Ladys are still about, though looking very faded, Meadow Browns have been here a few days and today saw an emergence of pristine condition Red Admirals. Skomer? Haven't I seen you on the telly? It's been a bit manic the last two days with a full complement of visitors, school groups, important meetings and TV companies. The sea is still flat calm and with the sun beating down on us it seems half the country has headed to south west Wales. Amongst them a group from the Joint Nature Conservation Committee who came over to check up on all the research work going on here. On the subject of research, a group has been out on the Amos today and ringed 300 Guillemot chicks as part of a large, ongoing study. You've probably seen Skomer on the television recently. Well, prepare to see more. They filmed a bit of Coast here earlier in the season and the last two days we've had people prospecting for Countryfile and The One Show. To top it all Iolo Williams was out filming today, Haf's still giddy about meeting him. Some of today's visitors were treated to the sight of a young razorbill chick leaving it's nest site down by the jetty. As soon as they're big enough to be able to swim properly, before their wings have developed, they are encouraged by their parents to leap into the sea - often bouncing off rocks on the way down - and head off into the blue beyond. This should be safer for them than staying on the cliffs. Unfortunately, this individual found that leaving in the middle of the day leaves one open to predation by gulls. It's a sight you get used to but one that's always a little distressing and depressing. On the positive side; if the chicks are leaving it means the adults are having no problem feeding them, which is always good news. In other bird news we've had both Turtle Dove and Robin on the island today. An early sign of return migration? Haf returned yesterday, ensuring a warm welcome by bringing a box full of ten fish and chip orders she'd collected from Haverfordwest. It took two kitchens to reheat that lot, though we soon cleared it all away, even if Tessa and I were the only ones piling away the mushy peas. As you can imagine the evenings are long and sunny at the moment, so I'm off now to another barbeque. Give it some more gas. Well it was a nice sunset and people stayed up for shearwaters, but no one managed it all the way to sunrise. Monday means no boats, so a variety of habitat management and paperwork tasks to catch up on. I took the volunteer wardens out bracken bashing in Shearing Hays (one of the old fields) this morning. We try to keep a diversity of vegetation on the islands and bracken can easily get out of control, preventing other species from growing. The puffins and particularly the shearwaters struggle to move through large patches of bracken so if allowed to expand it's area it'll impact on their available nesting space. So we head out there with a variety of bashing implements - canes, pipes and tennis rackets - and break the stems so they die down. It does look strange to anyone wandering past; six people swinging a variety of blunt weapons at the vegetation. The volunteers did a cetacean watch, part of an ongoing weekly project, and were anticipating a good few sightings after yesterday's dolphin excitement but were left disappointed. Still, we'll try and look in the same place this evening. With the seas so flat we went on a gas run. This involved loading up our little boat with fourteen of the big red empty gas bottles, taking them over to Martin's Haven and swapping them for ten full ones. Ideally this should be done at high tide otherwise, as today, one has to carry (or roll) heavy gas bottles up and down the beach. With this major job out of the way, and with it still being a hot day, I waded into the sea off our beach and swam across to the boat landing then ran up the steps. I wish I could say that this is my normal morning routine but it obviously isn't. The sea is around 13C at the moment; not too cold but you wouldn't want to stay in for too long. Sounds like it's going to be a busy day tomorrow. I'm off to prepare for it with baked potatoes for dinner, something I've not been able to have while we were running low on gas. Please ignore any unattended baggage. Absolutely flat calm seas and no wind meant perfect landing conditions for the boats. A few spots of rain in the morning soon departed and by the early afternoon it was really warm and sunny. All this was very helpful as we've had a big changeover day; the Oxford crew departed on the first boat, heading back to their university studies but leaving several thousand pounds worth of equipment in a bin-bag on the jetty. Cue a few frantic phone calls when they discovered and huge sighs of relief when it found its way into safe hands. We've another fifteen overnight guests arrived - it's understandably a very popular time of year. Haf's headed off for a few days at home, taking with her a big bag of dirty clothes to get washed, while Tessa got to the mainland for the first time in six weeks, making the most of it with a pub lunch. Two of the few reasons staff have for leaving the island. Flat seas always offer the best opportunities for cetacean spotting and the wildlife highlight of the day was undoubtedly in the evening as pods of eight then thirty dolphins were observed heading north. The first group were especially active, leaping out of the water and really putting on a show. 2 racing pigeons have taken up residence in the farmyard courtyard, the only problem being how to get rid of them! They normally only stay here because they're too exhausted mid-race to go anywhere else. They have been here 3 days so Jerry took them to the High Cliff and threw them off in the direction of the mainland, only to find them back at the farm before he'd had a chance to walk back......he was not impressed!We also have a lesser black black gull, a jackdaw and a pair of pied wagtail resident in the courtyard. The pied wagtails are very entertaining earlier on in the season when the male is courting the female he puffs his feathers up, holds his tail vertical and holds his wings up in a m shape-a very attractive fella. They currently have a couple of young chicks just developing quill feathers in a nest in the woodpile in the back garden. We have 2 Skomer voles that have taken up residence in the boiler cupboard in the assistant wardens accommodation. Quite good house residents I thought, until they started chewing at the aluminium foil recycling and the insulation foam around the boiler pipes. They are naturally tamer than other species of vole. 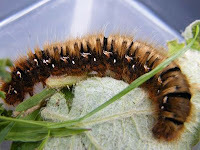 We also found a rather beautiful hairy caterpillar near our doorstep which we later identified as a Oak Eggar moth caterpillar. There were no day trip boats due to the north westerly winds, but thankfully the weather improved for a BBQ in the evening. We got to test out the new patio and boat seat which Jerry and Dave M had built- a really good sun trap. Also had our first "game" of cricket in preparation for the annual cricket match against Ramsay island......we may need some practice. Sam and Jess finished their 36 hour feeding watch on the guillemots at the Amos colony, it appeared to show a slower rate of feeding than previous years but the data has yet to be analysed. They also identify the species of fish being bought back for the chicks. Dave B started his 24 hour feeding watch so we'll await news of that. Had the excuse of friends staying to stay up late and watch the spectacle of the manx shearwaters coming in to land. It is a rather surreal experience as there are roughly 250,000 of these birds on Skomer, all of which have a call which sounds a bit like someone being strangled! They are amazing flying out at sea, just skimming (or shearing) the water, but as soon as they arrive on land they appear rather helpless tripping over vegetation or even their own feet. An unexpected delight was the appearance of glow worms lighting the way along the farm track-the first ones I've seen this season. You can't imagine what people thought of glow worms LED bright bottoms before electricity was invented.....I think you can see where tales of fairies came from. Woke up to the delights of gale force 7 wind and horizontal rain. This meant there was only a change over boat at 10am, no day trips. Oxford University has a masters field trip over this week, so one group was switching over with another group of students on the mainland. This involved a long chain of people passing bags back and forth, full of soggy bread and beer!They're on the island to do a census of the manx shearwater study plots, results so far are positive. Skomer's first shearwater chick of this year arrived today, it'll stay underground until late August, being fed by both parents for the next 70 days. When it emerges it looks nearly identical to an adult manx shearwater where as now I think its got down feathers which make it look like a poodle! I finished investigating which fulmars are incubating eggs, so now I'll have to wait until the middle of July to see which pairs have successfully produced a chick. I continued my productivity monitoring of the razorbills and guillemots, getting drenched by an unexpected shower in the middle of the day. The thistle flowers are out on the isthmus which connects the neck (a research only area) to the main body of the island. The yellow flag irises are also out in north valley which provide a very cheerful display of colour. I was walking down South Stream valley when I nearly stood on a short eared owl chick. It was quite large but motionless in the vegetation. I think I was as surprised to see it as it was to see me! Normally your walking along the paths when you hear hissing coming from the vegetation but you never normally see them until they're almost fledged. There are actually 4 short eared owl chicks in South Stream valley, they spread themselves out over a large area which their parents patrol and hunt in. They're able to run at quite a speed unless you walk up and surprise them which I must have done with this youngster, then they freeze and stare at you with there intense eyes pretending to be a rock! My day off, and its sunny-quite a novelty at the minute as normally it decides to be the one day of the week that rains!I had a couple of friends come over to stay for the evening, but because it was such gorgeous weather, half the UK population had decided to come for a day trip as well. They got to Martins Haven at 9:35am to get the 10am boat to Skomer only to discover all the mornings boats had sold out already. So be warned if your planning a trip to Skomer on a beautiful British summers day, get here early or be prepared to spend a day on Marloes sands instead! Anyway they managed to get over in the afternoon, so I enjoyed showing them the puffins bringing in sand eels for their chicks at the wick. Even though I spend every working day on the cliffs, its still enjoyable to just watch the birds antics in a more relaxed manner, and the puffins can never fail to produce a smile with their funny mannerisms. The chicks or pufflings as they're known won't appear out of their burrows until at least the middle of July, but hopefully they'll be growing well as we haven't seen any signs of pipe fish yet. These are a indicator of low sand eel populations, and can lead to the chicks starving as the pipe fish choke them. 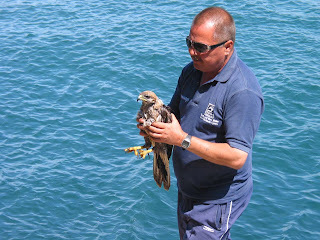 Carl was everyone's hero when he caught a buzzard that was drowning in North Haven after being forced under the surface by mobbing gulls. The poor thing was rather in shock, and soaked right through. After a session drying out in the sun, it spent the next 2 hours hiding in a bush in North valley, getting mobbed by the gulls again before escaping for some peace and quiet. Just had the delights of Jerry's banoffee pie, but have run out of vegetables, still I suppose there's still the multi vitamins or the chocolate.......or maybe even something from the garden-once its recovered from the rabbit proof fence failing a couple of weeks ago! The end of 5am alarm calls! Today is a fairly relaxing sunny day on Skomer after the hectic-ness of work over the last 2 weeks. I've just spent 3 hours doing my hand washing as I had quite a stockpile, unfortunately this coincided with the burning of the islands rubbish so hopefully it won't come out smelling worse than it went in! At the same time as doing the counts I had to keep up my productivity monitoring on the razorbill and guillemot chicks at 10 sites spread across the island. Some are now at fledging age and are rather adorable. One large chick I saw refused to bring its head out from underneath its parent even when the parent had stood up, its obviously not in the mood for jumping off the cliff just yet! The chicks normally get quite excited a couple of days before departing, walking around near their paren ts and flapping their wings in preparation. It is amazing how they jump off these high cliffs into the sea with their father at dusk, then swim away despite the fact they've never experienced water before. I always find the thought of bird migration baffling, but I was even more bowled over when thinking about the 1000 painted lady butterflies that appeared on Skomer last week. They had migrated from North Africa which is amazing when you consider how fragile butterflies look. The majority of them have left now so we're left with the rather worn out stragglers. Jerry and Haf are back on Skokholm for the day, doing a guided walk for the founders. I'm off to look at fulmar productivity, checking which ones are incubating eggs. I use a telescope for all my work, so I don't actually disturb the birds during their important breeding season. No boats on June 6th-8th due to strong North Easterly winds. This meant that the volunteers and guests spent a few extra days on the island, which everyone was happy about and the food supplies just about lasted out. The volunteers made use of all the extra time to do lots of hard graft including pit digging, gardening, compost heap turning, path clearance, sign maintenece, cake baking and some cleaning. We also managed to clear up a lot of accummualted metal scrap. One of the drawbacks of island life is that you put a lot of effort into bringing over all the things you need - from tinned tuna to tractor parts! But then you have to put lots more energy into taking off all the rubbish/remains you have created. This double handling of things onto the island and then off again makes you think hard about everything you buy/bring on. It makes you realise how little you need all the trappings of modern life that most people think of as essential. The highlight of the week was Pete's birthday (21 plus a few!). This was celebrated with Gin and tonics and a mass cake0bake. Pete was lucky enough to have five birthday cakes! Jerry and our new Long-term Volunteer Haf, have been on Skokholm for the last week and a half carrying out all of the seabird monitoring, which went well and numbers for everything look pretty good over there. They finished on Thursday and we were able to go and pick them up so they could return to the (relative!) mod-cons of Skomer. A couple of sightings of Spoonbills again on June 9th, seen from Skomer heading towards Skokholm and Jerry on Skok spotted them as they came in and got some great shots. 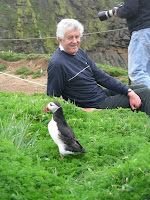 The birds then headed back to Skomer and were seen in the evening by a lucky volunteer. I will try to upload the pics tomorow. On Tuesday evening we carried on with the counts of Guillemots, Razorbills, Kittiwakes and Fulmar. We hope to finish a count of all the cliff-nesting birds on the island by the weekend and then hopefully can repeat the count to give us a more reliable estimate. Counts of study plots have also begun, these will be repeated ten times in the next fortnight and will give us a more reliable snapshot of the population dynamics. We were treated to a bit of fun with a young seal as we paddled the tender back in to shore on Tuesday evening. It enjoyed playing with the paddles and even seemed to want its tummy tickled! This is a young Seal and they are often more curious and playfull than the adults - not always a good thing as this Seal already had several scars on it's back possibley from boat propellors. Most of these Guillemots will have small chicks, they sit pretty tight so you have to watch for a while to get a sight of the egg or chick. The calls are the braying calls of the Guillemots and show what a busy, noisy place seabird colonies are - it is also quite smelly when the sun shines on all that fishy guano! Also some Kittiwakes incubating, some are still busy collecting nest material from grassy patches on the cliffs or pond edges around the island. The calls are of Kittiwake - one of those useful calls that sounds like their name - 'Kitt-eee-wake'. Its only been a few days, but a lot has been happening since the last update. On Thursday 28th, we had a visit form Rhodri Morgan, the first minister for Wales. He came with a few Wildlife Trust and CCW staff for the official opening of the Skomer Island Restoration Project, combined with the 50th annivarsary of Skomer being designated a National Nature Reserve. The day went very well and there was a piece on the news about it. The weekend was a busy one, we reached our maximum number of day visitors every day, helped I'm sure by stunning weather. Long may it last! The first of June brings the start of the cliff- nesting bird counts and we have been lucky with the weather again. Light winds and sunshine have meant we were able to get a full day out on the boat counting Guillemots, Razorbills, Kittiwakes and Fulmars, its one of the perks of this job! We have a couple of weeks to get all the counts done and will keep you posted with our progress. At the moment all I can say is there are a lot of them.